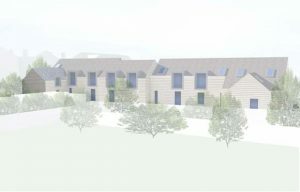 We have submitted proposals for three new houses on a former garage site in Streatham Common, south London. The houses, for developer Intraurban, are designed to be exemplar dwellings for the Borough of Lambeth and meet high levels in regards to the Code for Sustainable Homes. You can read more about the Code here, but essentially it is all about following best practice in the design of sustainable housing – something we take very seriously. You can see a model of the scheme below.